HLRS benefits from Quobyte’s unique combination of an S3-enabled parallel distributed file system – making internal data migrations before data processing obsolete while delivering linear scalability, better storage management, and overall greater system flexibility. Quobyte® Inc., a leading developer of modern storage system software, and NEC Deutschland GmbH, a leading provider of HPC solutions, announced today that they have delivered a complete storage solution to supercomputing site HLRS (High-Performance Computing Center Stuttgart) to fulfill their commercial and research HPC requirements. The HLRS facility is one of the top 20 supercomputing sites in the world and is amongst the top three in Germany. The facility is used by researchers and industry groups who typically run HPC workloads focused on Computational Fluid Dynamics (CFD), Physics, Transport and Climate, Structural Mechanics, Chemistry, Bioinformatics, and Electrical Engineering. Quobyte and NEC are both exhibiting at the ISC High Performance 2018 Exhibition and Conference in Frankfurt, Germany, from June 24–28, 2018 in booth K-415 and G-731 respectively. Building on a decade of research and experience with the open-source distributed file system XtreemFS and from working on Google’s infrastructure, Quobyte delivers on the promise of software defined storage for the world’s most demanding application environments including High Performance Computing (HPC), Media & Entertainment (M&E), Life Sciences, Financial Services, and Electronic Design Automation (EDA). 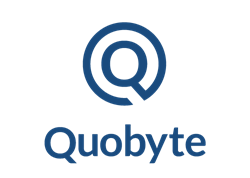 Quobyte uniquely leverages hyperscaler parallel distributed file system technologies to unify file, block, and object storage. This allows customers to easily replace storage silos with a single, scalable storage system — significantly saving manpower, money, and time spent on storage management. Quobyte allows companies to scale storage capacity and performance linearly on commodity hardware while eliminating the need to expand administrative staff through the software’s ability to self-monitor, self-maintain, and self-heal. Please visit http://www.quobyte.com for more information. NEC Deutschland GmbH is a wholly owned subsidiary of NEC Europe Ltd. and is a leading provider of HPC solutions, focusing on sustained performance for real-life scientific and engineering applications. To achieve this goal NEC delivers technology and professional services to industry and academia. Linux-based HPC clusters as well as our high-end vector systems meet the different needs of different customers in the most flexible way. Energy-efficiency is one of the key design objectives, addressed by advanced cooling technologies or by the high-bandwidth vector-architecture, which delivers unprecedented efficiency on real world code. The service capabilities from the operation of complex systems to the optimization of scientific codes and NEC’s storage-appliances complete our solution offering. The High Performance Computing Center Stuttgart (HLRS) is one of the top 3 German supercomputing sites which together form the German Gauss Centre for Supercomputing (GCS). It provides cutting edge supercomputing technology and services to German and European researchers and companies in engineering and the automotive industries. HLRS’s supercomputer Hazel Hen, a Cray XC40 system, currently ranks number 19 on the TOP 500 list of the world’s most powerful supercomputers. The HPGMG benchmark in 2016 even classified it as the second best performing supercomputer under real-world conditions. Please visit https://www.hlrs.de/home/ for more information.